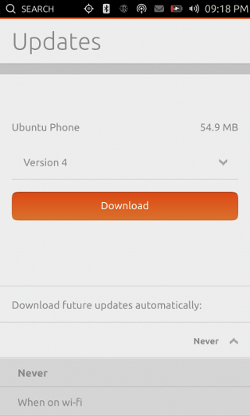 With the first ever Ubuntu phone touted to arrive in early 2014, Canonical is wasting no time in the development for Ubuntu Touch for smartphones. Currently, the four supported Ubuntu Touch devices include maguro (Galaxy Nexus), mako (Nexus 4), grouper (Nexus 7) and manta (Nexus 10). Anyone using one of those devices can choose to switch to the latest Ubuntu Touch image and have the "over-the-air" update capability right away! Anyone using one of those supported devices can choose to switch to the new images using: phablet-flash ubuntu-system. Once that’s done, further updates will be pushed over the air and can be applied through the Updates panel in the System Settings. For a more detailed analysis and any other additional information, see Stéphane Graber's blog post.